Before we dive into how you can best utilize this equipment, it is best to understand what it is first. A bench grinder is a type of grinding machine that is used to drive abrasive wheels. The difference between other grinding machines and the bench grinder is that it is mounted on a bench or table. Grinding machines such as die grinders and angle grinders are handheld. This machine can be used for sharpening cutting tools such as chisels, drill bits, tool bits, and gouges. All this depends on the type of bond and grade of the grinding wheel. Other than this uses, it can also be used to roughly shape metal prior to welding or fitting. A wire brush wheel or buffing wheels can be used interchangeably with a grinding wheel to perform the functions of cleaning and polishing work pieces. With that said, we can go straight into discussing the steps on how to use a bench grinder and the different instruments you will need. This is a wheel that can work on blades and in buffing up waxed wooden pieces or surfaces. The main purpose of this water is to cool down a friction-hot piece of wood or metal depending on what you are using the bench grinder for. You will also require the bench grinder itself. It should be secure enough on the bench to avoid excessive vibration and uneven results. In addition, a bench grinder tool rest is of utmost importance. It is advisable to use the one that came with the machine. Alternatively, you can get one that is more adjustable from a hardware store. This is for protecting your hand from the excessive friction that would come from the wood or metal being ground as a result of too much heat. This offers protection against excessive noise that comes from the bench grinders when in use. Before you begin grinding or buffing, you should set up the grinder for you to have success in your work. When you purchase a bench grinder or already have one, ensure it has the new style of wheels. At this point look for the word “friable”. This means the particles of the wheel starts being worn out and begins to break away, exposing new fresh edges, which help the grinding wheel run cooler. This is vital as it ensures excessive friction is reduced. 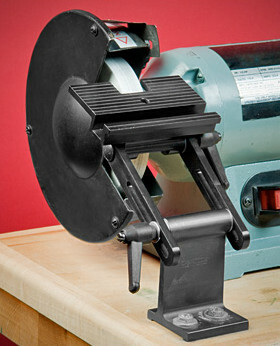 Another point to note is a bench grinder tool rest. If you have an older machine, replace the old tool rest with a new one. This is because the old tool rests are too rough, too small and too hard to adjust. You can purchase an aftermarket rest and the difference will be clear. Lastly, make sure you dress the wheel. Most people assume that it should be flat across the front. However, the wheel works much better if it is rounded slightly with a high point in the middle. You can use a flat diamond dresser to knock back the edges of the wheel slightly to end up with a nice smooth gentle curve across the front. Most cutting tools work best if their edges are ground at the correct angle. Most wood chisels require a 25◦ angle with a secondary micro-bevel angle of 30◦ at the tip of the blade. An angle gauge allows you to set the tool rest at the desired angle to get the best results. You can either purchase one or make it. Both options are inexpensive, so this is all a matter of preference. This involves touching the wood to the grinder at the place you want it to curve. To achieve the best and most accurate results, you should do it lightly and slowly. Use a back and forth motion as if you are trying to grind off a part of the wood. You will need a 36-grit buffing wheel to buff or shape wooden workpieces on grinders. Make sure you use a slow speed. To buff up your wooden piece, start by applying wax on it. Thereafter, buff the finish after the wax has dried. A bench grinder tool rest will come in handy when sharpening a chisel as it helps in resting your work on it. Once you have secured the chisel on the tool rest, hold the chisel securely with both hands. After that, push the chisel blade slowly to the grinder such that it is angled slightly up or down in relation to how the blade tapers off.This ensures the grinder gets the job done without overdoing it. Most chisels require a 60-grit wheel. Here, you will still use the forward and back motion as with shaping wood. Avoid making the tool heat up with excessive friction so much that it turns orange. When the chisel gets warm during sharpening, dip it in the pot or bucket of water to cool it down. To do this, hold the metal on the tool rest and turn it gently until the grinder comes in contact with the spot you want the cut. Ensure you keep turning the piece until it breaks in half. Also, hold both ends of the metal piece to get a clean cut. After you are done, dip the hot ends in water to temper it. So as you have seen, it is not that complicated to use a bench grinder as it has been made to believe. Remember to attach the wheel that is intended for the job. Also, the roughness of the wheel is dependent on what you are grinding. Once you master the technique, you are good to go.